I was 25 years old the first time I met an ex-combatant, it was in an interview I was conducting in 2013. 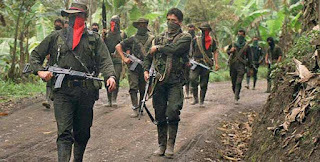 Although international and media prejudices portray Colombia as a violent context where all citizens face daily armed groups, drug trafficking and violence, the reality is that the conflict has been very segregated by region and social class, and only specific people have faced the tragedy. Thus, as a privileged, middle-class woman from the capital, I only had the opportunity to connect with an illegal group by doing specific research or work in a government institution. I conducted the first of multiple interviews to former paramilitaries in Magdalena-Colombia, as part of a program that resulted of the peace agreement between the Colombian government and the AUC 2003-2006. The program offered benefits -such as judicial exemption and socioeconomic support – to those ex-combats that agreed to contribute to truth. This experience provided me with an important lesson: each story was different from the previous one, every former combatant told me a piece of his life, his group, his town, our country, and each narrative was a fragment of the huge puzzle of conflict and peace that went far beyond two sides in confrontation. This experience, along with other subsequent jobs throughout different regions in Colombia, gave me the certainty that pacifically resolving the armed conflict with all groups was imperative, as well as transforming the conditions that caused and perpetuated the violence. Simultaneously, peace talks between the FARC and the government had been underway since 2012. This context and personal motivation brought me to Northern Ireland looking for an applied and theoretical experience in peace and conflict studies at Ulster University. That process broadened my knowledge into a comparative perspective with the lectures including case studies in Africa and Asia as well as the local experience in a post conflict society. This process again turned my attention to ex-combatants and their reintegration processes, which include education, reconciliation, communitarian work, status change, and political participation. I rediscovered the diversity both in the people and in their reintegration needs. Concurrent with my studies, in Colombia, the FARC-EP and the national government signed and ratified, amidst a polarized society, a peace agreement in December 2016. Despite the international support and recognition, the implementation of the agreement is highly dependent on political will, the presidential elections in 2018, and the commitment of the civil society. Among the multiple aspects of the agreement, the Demobilization Disarming and Reintegration (DDR) pointseemslike one of the few points that will be implemented under any circumstance, since it was established in advance, the process is already underway, and there is immediate post-conflict funding available in most cases. Because of this, the success of the DDR implementation has a pivotal role on all the other aspects of the agreement and peace process. On the other hand, DDR literature review (Chapter I) evidence that authors agree that reintegration is the least successful phase in the implementation process. There is also some consensus that reintegration theory is precarious, which suggests that improvements in both theoretical research and implementation are necessary in the field. Moreover, Colombian DDR experiences are underrepresented in the international literature, compared with cases in Africa and Asia. This literature tends to focus on the countries where the international community has played a key role in DDR. According to Muggah, “approximately two thirds of DDR interventions with international support were launched in Africa, with the remainder in Latin America and the Caribbean, South Eastern Europe, Central and South Asia and the South Pacific” (2010, p.3). Thus, despite having multiple peace processes experiences and antecedents (Overview in Chapter II), Colombian reintegration processes have been studied only recently in mainstream literature1 , with you a focus on the reintegration of paramilitary groups and guerrilla deserters in 2003-2016 as an example of success. This tendency in the analysis of calling the 2003-2016 reintegration process a “success” caught my attention, as my perceptions as a peace practitioner and Colombian citizen were the opposite. Additionally, the “success” seemed a deviant case in a trend of international reintegration failures. Research Question What is the theory behind reintegration for ex-combatants both in international literature and in the Colombian case, and how can theories of change improve theory and implementation in Colombia? 1. Critically review relevant DDR literature, focusing on the less explored theoretical aspects of reintegration of ex-combatants 2. Highlight Colombian contributions to the reintegration literature 3. Examine previous and current Colombian experiences in DDR, with an emphasis on the reintegration processes and their unresolved issues 4. Using a Theories of Change lens to analyse reintegration theory and propose hypotheses for the Colombian case and broader reintegration theory.